Staying on top of cell phone trends can almost be a full-time job in and of itself. Eric Ronay doesn't quite understand the appeal of having the hottest new mobile phone, but he seems to be in the minority. We want new toys and we want them now. Just as what's fashionable in clothing changes from season to season, cell phone trends evolve and change all the time as well. Here are some of the biggest current cell phone trends and we fully expect the mobile phone industry to continue along this path at least in the short term. Then again, who knows what kind of cell phones we will all have five, 10 or 20 years from now. Not that long ago, people were jumping all over the flip phone craze, perhaps best recognized by the unique Motorola RAZR phones that were released a few years ago. People loved the clamshell form factor and they really appreciated the slim profile that these handsets offered. Fast forward to today and we look to Samsung cell phones as being among the industry leaders, pushing the slider cell phone into the mainstream. There are many advantages to the slider form factor, because they typically offer a larger main diplay than their flip phone counterparts, while maintaining an equally compact footprint. There are also HTC smartphones that slide horizontally to reveal QWERTY keyboards, again offering a larger display than something like the Motorola Q or BlackBerry Curve. Speaking of smartphones, it seems that there is a growing interest in smartphone software, not only among the business community, but also among the general public. This is because many people are tired of restricting themselves to the basic suite of applications preloaded on their phones. When you look at the Windows Mobile or Symbian platform, there are innumerable third-party applications available that significantly expand the functionality of mobile phones. The "home" screen on smartphones is also a major plus, because it grants the user instant access to pertinent information like missed calls, upcoming appointments, and other key functions. Devices like the Apple iPhone offer much more versatility than more conventional mobile phones. We want to do more with our phones these days. The Apple iPhone isn't the first phone to offer a full touchscreen display, but it is certainly being credited with bringing that feature into the mainstream. PocketPC phones have had touchscreens for some time now, but after the release of the iPhone, people have recognized the versatility of eschewing physical buttons in favor of virtual ones on a touchscreen. From the HTC Touch to the LG Prada, there are touchscreen phones coming from nearly every manufacturer. 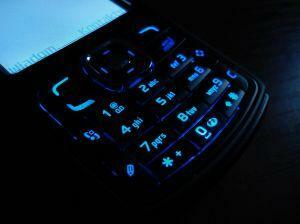 One of the most hotly anticipated touchscreen phones is the Verizon Voyager cell phone. This handset is the spiritual successor to the LG enV, featuring a full QWERTY keyboard on the inside and a large touchscreen on the outside. Nokia is reportedly working on a touchscreen technology (S60 Touch) that offers tactile feedback too. Mobile phones aren't just for making phone calls. Mobile entertainment has become an important component to many cell phones and critical to this package as multimedia. Music phones like the Sony W580i merge the functionality of a phone with an MP3 player, whereas camera phones are taking pictures that are almost as good as standalone digital cameras. Staying connected means staying entertained. In addition to music and pictures, mobile Web surfing is gaining in popularity. The Safari web browser on the iPhone is particularly powerful, even when compared against Pocket Internet Explorer on Windows Mobile devices. Cell phone trends are a tricky business, so you've got to keep your ear to the ground and pay attention to popular culture. On their way out are phones like the Motorola RAZR and on their way in are phones like the T-Mobile Sidekick Slide and Apple iPhone. Of all the trends, the one that is the most prominent is an obvious one: more functionality. We're a culture of wanting more of everything and cell phones are no exception.